It’s been one of those days. You know, the type of day where you just can’t wait to crawl into bed, knowing that when you open your eyes, at least it will be a different day? Tonight, let me focus on the problem we HAVE NOT gotten rid of yet (check here and here for reminders as to what’s been going on)…and that would be deer. That’s right, they’re still here. And for argument’s sake, let’s just say the number is 500. 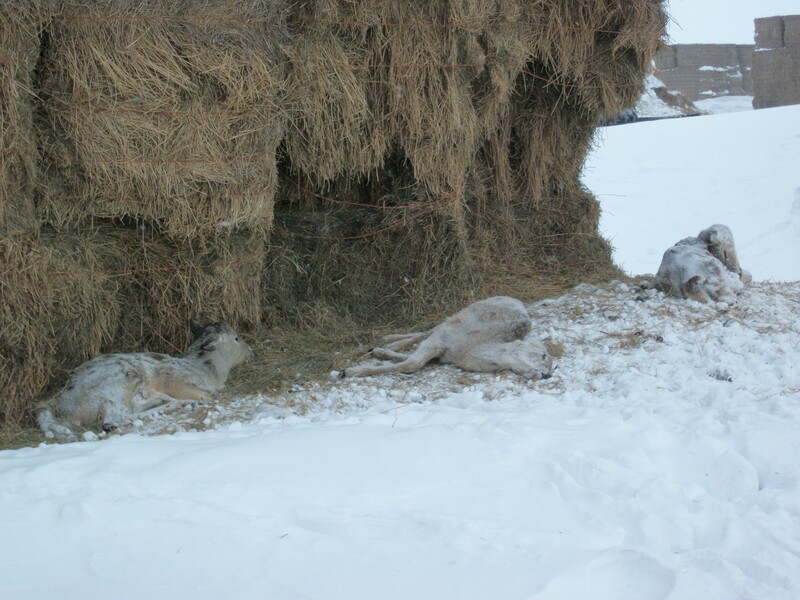 The deer are dying in and on our feed supply for our cattle. Boss Man is trying to put plans in place so that we’re able to be better prepared for next year. Apparently this year is a loss. We will never get back what the hay was worth that has been destroyed. (Think in the terms of multiple thousands.) There is nothing we can do about that. So we need to move ahead. He spoke with North Dakota Game and Fish today. They are less than receptive to assisting. According to them, we have been uncooperative. By uncooperative, they mean that we were not interested in the only plan that they came up with. This “plan” was to wrap our bales with a plastic wrap, that would supposedly deter the deer from eating our hay. Every person we have spoken to regarding the plastic wrap has claimed that it does NOT work. Not only are there problems with the wrap coming undone, or stacks falling over, but remember that we’re trying to sell our hay that is salvageable. That means that we would have to wrap and unwrap bales each time we were moving or grinding hay. We would also have to dispose of the wrap as we were using the hay. Another concern we had with the hay wrap was that once the deer made our yard their winter habitat, without STRONG encouragement, they would still be in our yard, just forced to feed with our cattle. The deer are a danger to our herd, just by being in their feed supply. But the danger would be even greater if they were nose-to-nose and feeding out of the same bunk. So, by trying to protect our livestock, while still being conscientious of the wildlife, we are now deemed uncooperative. Thank you. Tonight, Mark decided to be proactive and try to call some of the neighboring landowners, making them aware of what the problem is, and asking if we could all be more receptive to allowing hunters access to prime hunting land. The first call was to a “neighbor” who happens to own a hunting lodge and guide service. He basically thanked my husband for ruining his evening, told him not to tell him how to run his business and hung up the phone. Most of the other phone calls went very well. Most people understand what the problem is, and are willing to do what they can to help. Here’s hoping that they remember next fall. Here’s what I’d like to remind Game and Fish: this isn’t just another hay yard, another complaining farmer, another “problem” that they’d rather not deal with. This is MY hay yard, MY herd and MY sons’ futures. I have four boys that I hope have the opportunity to continue to make this farmstead their home, and continue to live and prosper in North Dakota. I hope and pray it’s not just a dream. And by the way, if you’re looking for a place to hunt this coming fall, I can hook you up…bring your family, your friends and your neighbors! This entry was posted in Agvocacy, Boys, Brothers, Cows, Farm life, Hunting, Nature, Winter and tagged agriculture, agvocacy, calving, children farming, deer hunting, farm life, future farmer, hunting, life on the farm, nature by wagfarms. Bookmark the permalink. Hunting lodge neighbor – not very neighborly, huh? Y’all are just trying to fix the problem, right? Better he should work with you than against you. Unbelieveable! Let’s start a phone campaign to Fish and Wildlife. I may get a gun and hunt just to help you out! Val – I’m there this fall. I’ll get behind the wheel of one of the Masseys, make a mess in a field, and take care of some of that pesky wildlife. Stick with it, there’s gotta be a solution here somewhere. My thoughts and prayers are with you as always! Just wanted to share an observation with you I know you’ll find interesting. Last weekend my girl and I went to Bismarck-yes in the blizzard, but on the way home it was a clear and beautiful day and could see for miles. What I saw was upwards of a thousand deer along hwy 10, big herds trickling into more big herds, running into haylots, spilling over into feedlots mingling with cattle… You get the picture. I can imagine natural disasters affecting your livelihood, but something like these critters that could be controlled, it’s frustrating!! !